I first heard about Tokyoflash in a podcast I listen to called Japancast. They were giving away a watch as a first place prize. Whenever they were trying to describe the watch on air to listeners, they always had a difficult time explaining the appearance. Usually Japancast just told you to go to their website to take a look at it. Once I did what they suggested, I understood why they had a hard time explaining it. Tokyoflash offers a very unique style of watches. I can almost guarantee you that you wont find these watches anywhere else. While the watches may just look like a piece of jewelry you would see on people that call Shibuya home, every watch that Tokyoflash offers tells accurate time. Lets take a look at Tokyoflash’s Shinshoku watch for example. This watch is one of Tokyoflash’s most popular designs, and one I have considered purchasing one for myself. The watch has 3 different color LEDs. 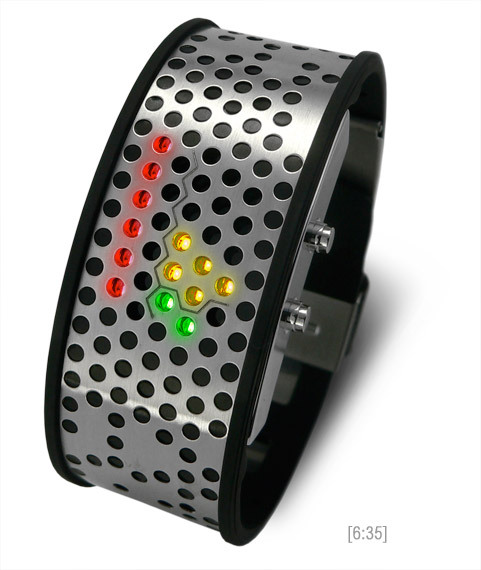 The red LEDs represent the hour, the yellow LEDS represent the minutes, and the green LEDS represent 15 total minutes. 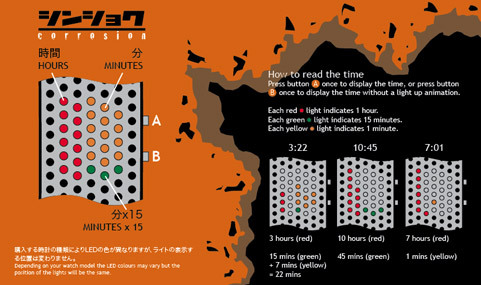 So say you have 6 red LED’s, 5 yellow LED’s, and 2 green LED’s, then the time would be 6:35. Get it? Each watch features a unique way of telling time. Tokyoflash has a great selection of custom watches to choose from. Check out Tokyoflash for more great watches.